This week’s holiday celebrations around the world features a country I know very little about, Ethiopia. Amber from Global Munchkins is sharing the fascinating history of one of the world’s oldest nations. 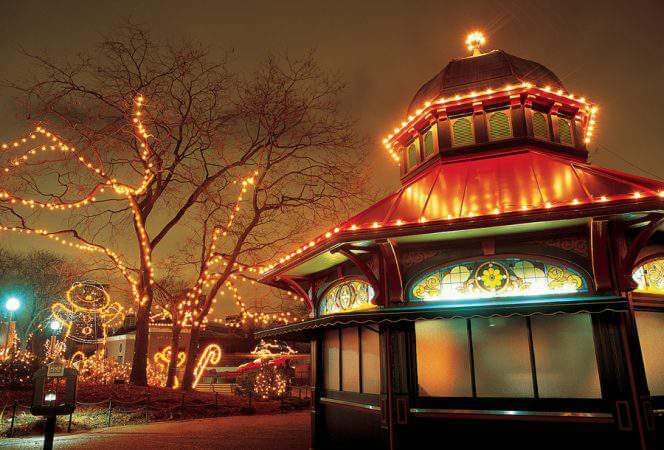 The celebration may be quite different from a traditional western Christmas, but it extremely festive in its own way. Ethiopia holds a very special place in my heart since it is the birth country of my son Shea. Since bringing him home in 2010 we have visited Ethiopia twice and each time I go I fall more in love with this amazing country. Most people think of starving children and poverty when they think of Ethiopia. Today I want to share with you the Ethiopia I know. 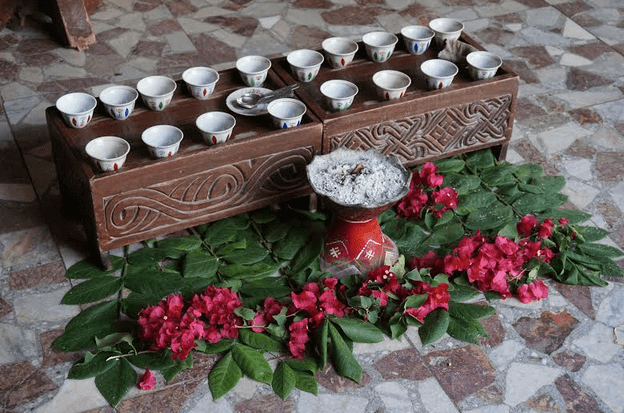 One steeped in rich tradition, culture and religion. And, yes the birthplace of coffee too! 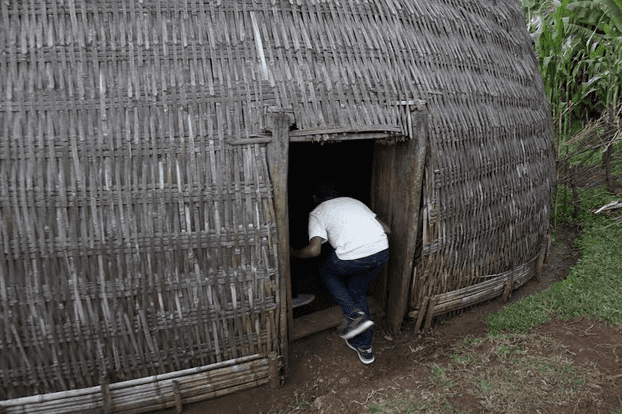 A traditional tukul in Ethiopia. 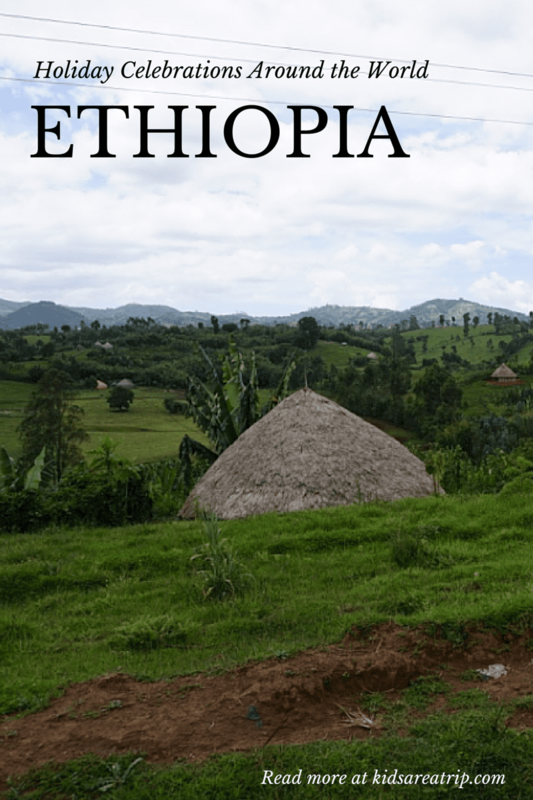 Ethiopia is one of the oldest nations dating back to 2500 B.C. They converted to Christianity in the early 4th century around 330 making them also one of the oldest Christian nations. Ethiopia still uses the old Julian calendar today, so they celebrate Christmas (known to them as Ganna) on January 7th. Ganna is followed by another celebration unique to Ethiopia known as Timkat. Let’s take a closer look at both of these celebrations. No, you won’t find any Christmas trees, twinkling lights or many gifts being given during Christmas time in Ethiopia. Nevertheless, this does not reduce the enchantment and boundless spirituality involved in the Ganna celebrations. For Ethiopians this holiday time is marked by good food, church services, time spent with family and traditional games. Ganna begins by fasting the entire day prior to January 7th. 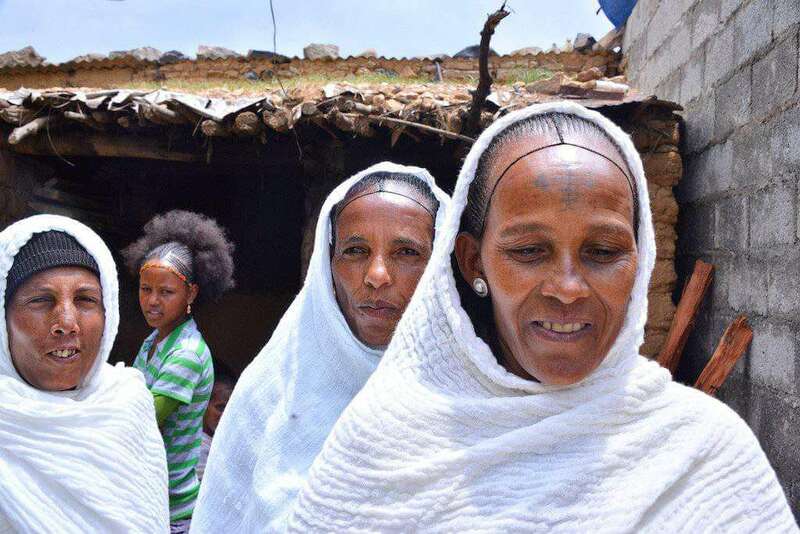 At dawn on the morning of, Ethiopians dress in all white usually donning a traditional shamma (a thin white cotton piece of cloth with brightly colored stripes across the ends) and head to church around 4am. Mass can last 3+ hours and there are no chairs, leaving Ethiopian men, women and children standing during the length of the service. As people enter the church a single candle is handed to them to pay homage to the Holy Trinity. The people proceed to walk around their church three times in a solemn procession, holding their lit candle. The perimeter represents the first circle. Then worshippers go to the second circle to stand during the service, with the men and boys separated from the women and girls. The center circle is the most important and holy place in the church; it is where the priest serves Holy Communion. After mass the feasting begins. Part of the Ganna tradition usually involves purchasing a goat or cow, and slaughtering it for the stew. Ethiopians eat traditional dishes of “wat” which is a spicy thick stew that contains meat, lentils, vegetables and sometimes egg. 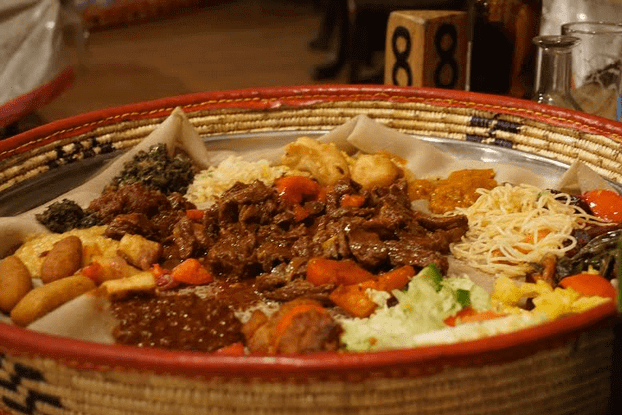 These stews are served family style on top of a huge piece of injera. Injera is a traditional Ethiopian bread that looks like a giant pancake and tastes similar to sourdough. Smaller pieces of injera are rolled up on the sides and used as an edible spoon to scoop up the wat. Next men and boys gather to play a ball and stick game also known as ganna. It is a brutal, high injury potential game similar to field hockey but with less rules. Players use a curved stick and a round wooden ball. The goal is to try and knock a rur, or wooden ball, into a small hole in the ground. This game is anything but peaceful. But is played because according to local tradition, the biblical shepherds were playing this game while tending their flocks on the night that Jesus was born. It is also Ethiopian tradition that one of the wise men that visited Jesus was from Ethiopia. Twelve days after Ganna, Ethiopians celebrate another festival known as Timkat. 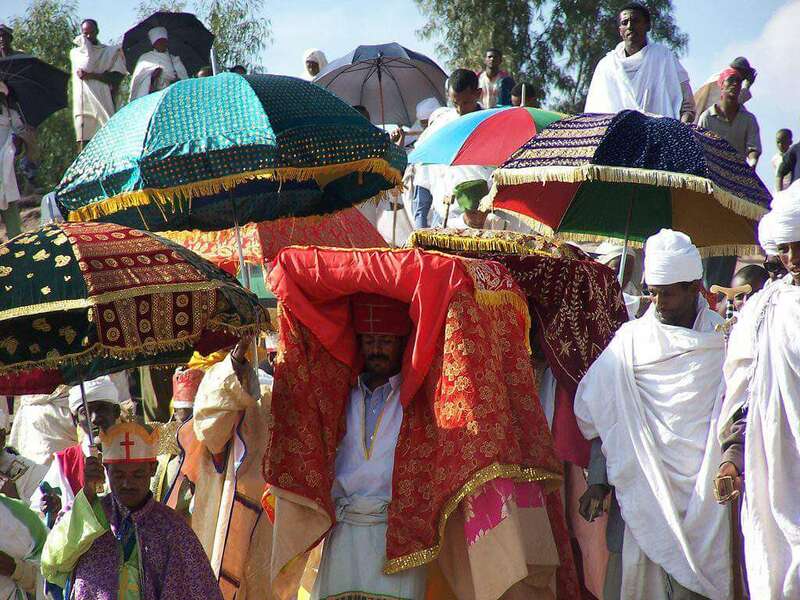 Timkat is the most important Christian holiday in Ethiopia. It commemorates the Epiphany, or the baptism of Jesus in the Jordan River by John the Baptist. During Timkat children walk to church services in a procession. They wear colorful crowns and robes. Their grown-up counterparts wear a shamma and follow the priests, wearing their red and white robes and carrying beautiful embroidered fringed umbrellas, toward the water. The priests lead the people to the water, so they can bless them and cleanse them of their sins by splashing water onto them. It is a symbolic way for them to renew their baptism each year. During Timkat Ethiopian men play another sport called Yeferas Guks where they ride on horseback and through ceremonial lances at each other. More food, coffee and dancing follows. Ethiopians are some of the most warm and welcoming people I have ever met. I have been invited to weddings, into homes and out to restaurants by complete strangers. As much as I love my Christmas tree and giving gifts to loved ones I have to say it is somewhat inspiring to stand captivated surrounded by so many spiritually connected and passionate individuals on such a sacred holiday. 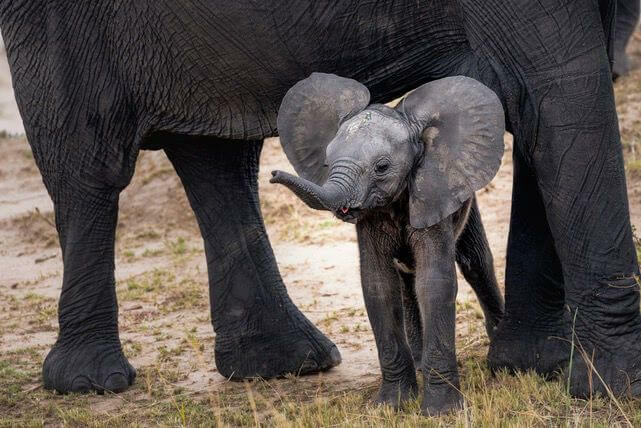 I hope one day you get to visit Ethiopia to experience its beauty and hospitality. What do you think about Christmas in Ethiopia? Have you ever experienced something like this? Don’t miss our other holiday celebrations around the world: Germany, Sweden, Japan, London, India, and Mexico. A mother to five through birth and adoption, self-made entrepreneur and now travel writer Amber Mamian keeps her hands pretty full. With her website Global Munchkins, she enjoys sharing her passion for travel by teaching other families how and where to travel with kids. Besides sharing her family’s adventures she also offers readers an inside peek at her life raising 5 kids in a multi-racial family as well as her thoughts on adoption.